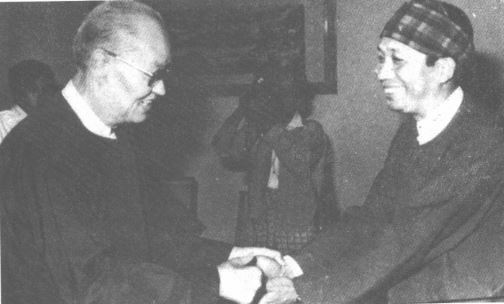 Maran Brang Seng, on one of the occasions leading Lute Band group, cheerfully welcome visiting General Aung San to the Myitkyina, Kachinland in November 1946. General Aung San was in town to campaign the ethnic Kachin elders in the events pertaining to the forthcoming “Panglong Conference”, and in persuasion to state the independent country into unionized and collective nationhood. The following beautiful song was sung in reception to General Aung San by Maran Brang Seng’s Lute Band group in Myitkyina in November, 1946. We sing to greet you, and gladness from near and afar. We sing to welcome you. It was one of the initial political movements of Maran Brang Seng and it symbolized to the future involvements in the birth of new independent Burma facilitated by Gen. Aung San with the driving convention of Panglong Conference. Following after the successful convention of different ethnic groups of “Panglong Conference” on 12 February 1947, the birth of new independent country as the Union of Burma was established on January 4, 1948. Hence, the formation of Kachin State was recognized and marked the event as Kachin State Day on January 10, 1948. The Kachin Independence Organization (KIO) has been existed until now half the century since it was founded on 25th October, 1960 in upper Shan State, Lashio area. Consecutively following the year at the same place gave birth to its political armed wing as Kachin Independence Army (KIA) on 5th February, 1961. During the time which marked the nation’s high political crisis reached at the zenith of frequent dark hour of political nightmare of the nation. In aware of the situation U Nu on 26th September 1958 broadcast to the nation in disturbances to handle the political condition of the country called upon the heat of the army Gen. Ne Win to placate the situation necessary for conducting of a free and fair general election as soon as possible. Gen. Ne Win firmly took the commanding action forcefully from October 28, 1958 to February 6, 1960 until the nation was overthrown into political chaos. Following his successive terms he maintained general election and Anti-Fascist People’s Freedom League (AFPFL known as Hpa Sa Pa La in Burmese) led by U Nu won at the election. U Nu again became the Prime Minister of the Union of Burma. Thenceforth, Buddhism was proclaimed as state religion and long after years of political dilemma compelled the situation as an umbilical cord to the formation of KIO, KIA justice seeking means and ends for the ultimate resort. Notwithstanding to the revolution movement began, despite the fact the engagement for political peace process was upheld around every 10 years, it has been conducted through the cumulative years of 4 times during 1963, 1972, 1980 and 1990-1994 until now right to the present. The gaining political peace process was become main objective to meet the round summit with those Revolutionary Council government (RC), Myanmar Socialist Lanzin Party government (Ma Sa La), State Law and Order Restoration Council government (SLORC known as Na Wa Ta in Myanmar) and State Peace and Development Council government (SPDC). The modern Kachin political revolution was first organized by Lahpai Naw Seng (double “BGM” holder, Burma Gallantry Medal) in the name of Pawng-yawng National Defense Force (PNDF) and later followed by Lahtaw Zau Seng (BGM holder) as an active member of this organization. Lahtaw Zau Seng himself become one of the founders of KIO to the consequent year of his following PNDF unsuccessfully lead by Lahpai Naw Seng. It was so mistakenly calculated the unwarranted big expectation of Panglong Conference which crushed the spirit of the Kachin People. PNDF’s initial revolution was unturned the milestone of engaging 150 days of political movement. Nonetheless, the PNDF advanced the general ideology for Kachin in motivating the architect of designating the national flag. As an aftermath of its national flag post and movement, its meanings and definition on various virtue emphasizing the totem of mode and desire worth carried on further to the next Kachin revolutionary (KIO, KIA). Hence, the flag of KIO its designation conceived the same principle of Pawng-yawng National Defense Force. Following the year during 1950 around the month of April they took the other side of the pole destined to bid farewell in eternity. 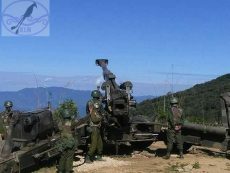 Lahpai Naw Seng left for China and Lahtaw Zau Seng went to Karen Kaw-tu-le, Kachin National Defense Organization (KNDO) located to the borderline of Thailand. Lahtaw Zau Seng was brought up into the Christian family. His father was a pastor Rev. Balawng Du and his mother Mrs. Lahpai Nang Htang was a school teacher. It was during the period of cold war era in which the KIO was formed. On the other hand, the nation was engaged in fierce battles with China’s Kuomintang (KMT) which retreated to Burma seeking the military footholds, regarded them contrary to the political dictum of the China Communist Party (CCP) led by Moa Ze-dung. As KMT took the based footholds on the borderline of Thailand and Shan State, it became the solid ground for them to launch counter offensives against CCP in China. KMT was invigorated with the American Democratic ideology and various supports including military aids. On the other hand, the nation soil seemed to be a hot battle field like Vietnam and Korean Wars. The esteemed purpose for the creation of KIO was to establish sovereignty as an independent nation state. And its formation of armed wing KIA was uphold the objective of KIO to the esteemed realization of sovereign nation. The English was deemed to use as an essential official language by which rule, orders and notifications were read and carried out accordingly to its official statements until 1967 from the beginning of KIO. During the prolonged movement struggles of KIO (1920-2010, a half century) there have been five heads leading the KIO.